I listened to a programme about road accidents on BBCRadio 4 on Friday 15th October 2011. Apparently, about one million deaths result from road accidents each year world-wide. The presenter talked about the now famous boda boda (motorcycle ‘public’ transport) in Uganda’s capital City,Kampala. 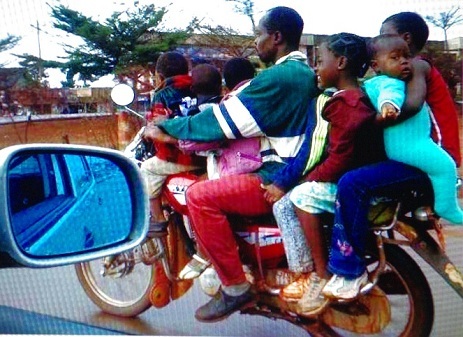 Boda boda have become a real pain in Uganda. They will get you to your destination quickly, but the associated accident risks are quite high, not least because some of the ‘drivers’ have not got their permits through the right channels. The presented then interviewed a surviving accident victim. The man was passenger on a boda boda that knocked a woman pedestrian, who died on the spot. The passenger, however, sustained serious injuries including a broken leg. He fell unconscious but some good Samaritans took him toUganda’s referral hospital, Mulago. When he became conscious again, a doctor examined him and recommended an amputation of part of his leg. The patient wasn’t only amused, but also didn’t have the financial resources to sustain the medication and related costs. Therefore he waited till the night, bribed the security man and disappeared to his home village where he was attended to by a traditional healer. At the time of the interview, the victim had cured, walked with a limp, but most importantly, still had both feet. This brings me to my personal experience – not entirely, but almost! I was one of a dozen or so people who were travelling at night on a 5 ton college lorry (truck) which was fully loaded bags of food. We stopped at a trading centre to unload a shopkeeper’s merchandise. The lorry reversed into a side road and out of nowhere we heard someone crying for his life. The lorry had stepped on drunken man who was sleeping on the side-grass around the corner. It was quite scary looking at the shattered leg – it is not uncommon for a Ugandan lorry to carry up to double the legal weight. We took the man, who had by now almost sobered to the nearest hospital about 15 miles away. The doctor examined him, and the immediate advice was to amputate part of the leg. But, of cause amputation could only go ahead with the consent of the patient. Despite the pain he was in, the patient decide to seek advice from his relations. He requested us to send a message to his father and brother informing them of what had befallen him. We ensured that the relations received the message that very night – and forgot about the man after that! One day, more than a year after the accident I visited the local market and who did I see? Yes, he was limping a bit, but he was indeed the accident victim with both legs! This is his story. Upon receiving the message, his father and brother got on their bicycles and cycled about 18 miles in the dark night to the hospital. They decided to do so for two reasons. The first one was because there was no relation attending to the patient. The second and most important reason was to get to hospital as quickly as possible in case the doctor took personal responsibility to go ahead with the amputation. However, the two men took a decision before even seeing the severity of the injury – that they wouldn’t allow their son/brother to go ahead with the amputation. When they got to the hospital, they demanded for their patient. They put him on the carrier of one of the bicycles and PUSHED (they did not cycle!) the bicycle with the patient seated on it all the way back to the village – 18 slow bumpy miles! I leave you to imagine what shape/state the patient was in when they arrived. The patient was taken directly to a traditional herbalist, a specialist at treating such injuries. I have never witnessed what happens, but this is what I have been told. The herbalist administers some herbs on the patient and then sends the patient home. However, the herbalist also gets a very young (the size of a limb) banana (plantain) and breaks it. This young banana eventually acts as a proxy for the patient’s broken limb. The patient is instructed to be ready at a certain agreed time each day, when treatment is administered. Each day, at the agreed time, the herbalist attends to the young banana. By doing that, (s)he remotely accesses the broken limb of the patient. The patient feels everything that is remotely done to the proxy limb, and depending on the circumstances can scream in pain. Whatever happens to the young banana, also proportionately happens to the actual limb, until both the young banana and the real limb are fully recovered! The treatment therefore, goes on until the young banana recovers – until it starts growing upright. Of course the patient also re-visits the herbalist at agreed intervals. I emphasise that I have heard about this ‘remote control’ from other people – but have never personally experienced it. However, there is overwhelming evidence that makes me (almost) believe that it does happen. Chinese acupuncture was not recognised by the West for a long time – until there was overwhelming evidence for its effectiveness. If it is true, this remote control traditional approach can make a difference between retaining both limbs, and only surviving with one of them. Maybe there is something about ‘remote control’ that needs to be recognised by the West as well – but this will also require overwhelming evidence for its effectiveness. Have you ever had first had experience of, or witnessed remote control? If you have, please share your story with us. Do you know someone who knows more about this remote control? If so, please contact them and share the story with us. My son said: Daddy, it looks like he is carrying a whole Day Care on a motorcycle! Did you say: “Maybe there is something about ‘remote control’ that needs to be recognised by the West as well”?